Just the other day I overhead a little girl ask her mother where the kids’ beach was because front beach was too scary. Having spent every summer of my life here at the beach, I could relate to that sentiment. As a really little kid, probably age six and under, I was completely afraid of the waves if they were even the tiniest bit large, and that meant anything over my chest. Needless to say, I spent the majority of my time in the surf letting the sea foam gather around me while becoming covered in sand. Sometimes I would agree to go out a little deeper as long as my dad was with me. I figured if dad was there then there was zero chance that I would meet my untimely demise. Then came the time that I agreed to let my aunt take me out. I figured she was a grown up just like my parents and I’d be fine with her. Wrong. I was in my inner tube and my aunt was pulling me around with a rope that was attached to it. I was having a great time until a tsunami-like wave came and sent me flying. I remember somersaulting underwater and seeing the deep murky dark water mixed with the light green of the surface water and thinking that I would never wash back up on shore. However, I did wash back up, realized I was alive, and promptly bawled and ran to my mom to tell her what her sister did while watching me. After that, I resumed my ocean-life in the sea foam. A few years later I was a little older and went out a little deeper courtesy of a tube and arm floaties. 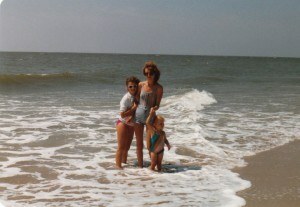 That’s when I decided that my sister’s idea of taunting the ocean would be fun. We were riding the small waves and having a great time. They weren’t big enough to be scary or too splashy, they were just right  for me, anyway. My sister, who has always been a daredevil and insists to this day that nothing scares her other than zombies, wanted some more action. So that’s when we decided to start saying “weasely waves” each time a wave came. My sister’s thought process was that if we criticized the ocean long enough it would give us what we wanted. In other words, my sister was bullying the ocean. But the ocean wasn’t about to be bullied. Out of nowhere another tsunami-like wave came and sent us flying. My sister (who is probably not right in the head) was shrieking with delight while I was just shrieking. Enough water went up my nose that I was gagging and sobbing and finally walked with my legs shaking back up the beach to rescue my tube and find my parents. My maniacal sister stayed in the water and continued her taunts. A couple more summers went by and I was 10 years old. Mom went into town to get groceries (back then, the Piggly Wiggly was the IGA and if you think the Pig is picked over nowadays, it was even worse in those days). So my dad was the one that was babysitting all of the kids. Keep in mind that he invented the term overprotected. Even now that I am 29, my dad still feels the need to tell me to not get in the water if there are no adults around. Anyway, so he was babysitting us and we were all out swimming. My brother and crazy sister were out deeper than I was, but I was still out deeper than ever before. Then my overprotective dad went back up to the house for either a phone call or to get something, I’m not sure which, but he said he would be right back. Regardless of what he was doing, he must have taken a vacation from his overprotective nature because he left me to my own devices out in the ocean. I was nervous being out there with my rogue siblings, but I figured I would be fine. Then, like the years in the past, the tsunami-wave came. It knocked me completely upside down so that I did a headstand under the water. I came up with a load of sand on my head and in my bathing suit just as my dad was walking back down to the water. Remembering my history of terror in the ocean, he looked at me thinking I was about to freak out. But that was the day it all changed. I loved every bit of being knocked upside down in the ocean. It was thrilling and best of all, I didn’t even come close to dying. I spent the next 15 years completely addicted to the big waves. Low tide, my former friend, became the tide for boring old people. I learned many different ways to tackle the big waves. Some were perfect for riding in to shore, others could be jumped over, and others required me to dive under them to avoid certain death. My friends and I would play a game called “Perfect Trust” out in the water where one person would stand with his or her back to the ocean and would have to rely on the rest of us to say what kind of wave was coming. Most of the time, we were honest and would say a big one was coming and to get ready, but other times, we would let the person get clobbered. As the years went by, we always thought it would be so weird when we got older because older people never seemed to want to go in the water  especially when it was rough. But then came the day when we became those older people. My friends and I were 25 when we became scared of the big waves (or scared again, in my case). We were letting the waves beat us up and then before we knew it we were stuck in a really strong current. We waved up at our mothers on the deck indicating we were probably going to die. But all they did was wave back as if we were saying hello. Panic set in. Chronologically I was 25, mentally, I was 6 and my aunt had let go of the tube. It probably wasn’t the smartest move, but my friend and I held hands and managed to get shallow enough that we were no longer getting sucked out by the waves. We staggered onto shore and collapsed. We looked at each other and started laughing because we both knew right then and there that we were adults. What had happened scared the hell out of us, but if it had happened a few years before, we would have run right back into the water. Since that day, our time spent in the water has slowly changed. Now we like to go in when the tide is either coming in or going out because you can get the best of both worlds. We even look at the tide charts to see when low tide is, all the while knowing that this was a tide that we said was for boring old people. So maybe we have become boring old people, but nowadays there’s nothing better than going out during low tide when the waves are gentle and relaxing in a tube. But that doesn’t mean we don’t still go out from time to time and fight the big waves. After all, we’re not that old. Yet.